I feel like I’m actually providing seasonal recipes for you guys this year. In the past I would just post whatever recipes I felt like posting and they usually didn’t line up well with upcoming holidays or seasons. I’m the kind of person that drinks hot chocolate in the summer and eats pumpkin all year round, but I’m trying to remember that not everyone is like that! This year I want to provide lots of delicious, warming fall recipes for you guys, many of which will of course include pumpkin! But don’t worry. Not all my fall recipes will include pumpkin. I know there have to be some people out there who aren’t big pumpkin fans, so I’ll be sure to share non-pumpkin recipes this fall and winter as well! 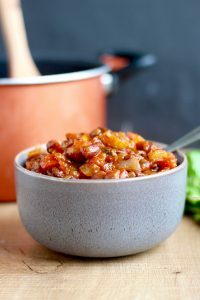 But today I am sneaking in some pumpkin with this Vegetarian Pumpkin Chili Recipe and man, oh man, was it a good decision! 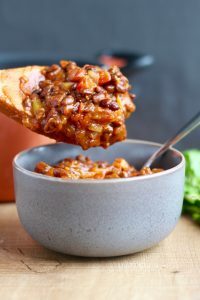 The pumpkin flavor isn’t overwhelming in this chili recipe, but the pumpkin puree adds such a rich creaminess that I love. 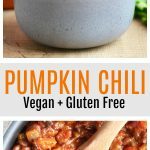 I don’t know about you, but I love my chili thick and the pumpkin puree creates a hearty, thick chili versus a soupy chili. 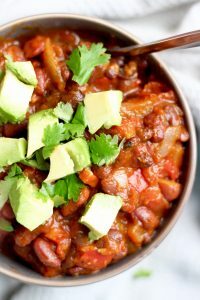 This Vegetarian Pumpkin Chili is high in protein thanks to lots of beans and is full of hearty vegetables to keep you full! 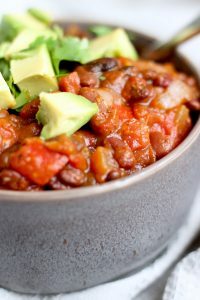 I really hope you guys can give this Vegetarian Pumpkin Chili recipe a try! Let me know if you do by leaving a comment down below and rating the recipe. 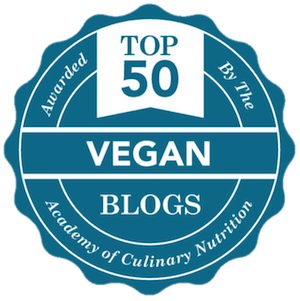 Be sure to share it with others as well! I also love to see photos on Instagram so be sure to tag @theconscientiouseater there so I can the final product! 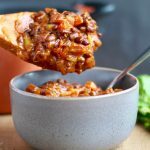 Full of hearty veggies and creamy pumpkin puree, this Pumpkin Chili is a fun spin on traditional chili and is sure to be a crowd pleaser this fall season! In a large pot, sauté the onions, garlic and carrot until softened. Add in the chopped celery and bell pepper and sauté a few minutes more until soft and cooked through. Add in the spices--from the chili powder to the black pepper--and stir until all the veggies are coated in the spices. Continue stirring and cooking the spices for a few minutes. 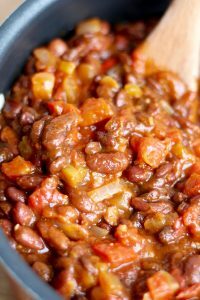 Add in the canned chopped tomatoes, kidney beans, black beans and pumpkin puree and stir to combine. Bring the chili to a boil and then reduce the heat to a simmer. Allow the chili to simmer for 10-20 minutes. If you like your chili a bit runnier, add in some vegetable broth to thin it out. I love mine thick so I don't add any extra liquid. Towards the end of the cooking process, taste and add more salt and spices to your liking. 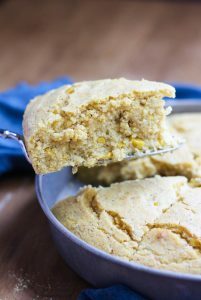 Once all the flavors have melded together and the chili it warmed through, serve it topped with your favorite garnishes and some Pumpkin Corn Bread Muffins if desired! I’m thinking of using fresh butternut squash….hmmm. I also have pumpkin flour but not puree. I also wonder about an instant pot conversion. We use 2 T. of chili powder. often so no worries about too spicy. Thank you! Let me know if those substitutions work for you Tammy! Pleaded butternut squash would be just the same in my opinion so I’d vote for that! Keep us posted! Hi Rachel! Good question. I have actually never owned a crockpot so I’m not familiar with times and temperatures. My suggestion would be to google another vegetarian crockpot chili recipe and go off those times and temp! I hope that helps and I’d love to know what you end up doing and if it works for you! Is 2 tbsp. of chili powder correct? I used that amount of mild chili powder and the result was a lottttttt of inedible food. My husband and I both LOVE spicy food but even this was too much. I tried everything to cool it down- added sugar, citrus, dairy, more pumpkin, more tomatoes, even peanut butter!- and it’s still way too hot. Which is a shame because all the other ingredients work so well together. Hi Leah! I’m so sorry this meal went to waste for you guys. That’s always so frustrating! Yes, I do like it with 2 tbsp. Did you use the chili powder that’s a mix of paprika, cumin, garlic, onion, oregano and just a touch of cayenne? That’s the chili powder I use when making chilis. I’m wondering if you used a fully cayenne-based chili powder??! That would definitely make this inedible. Either way I’m so sorry for your wasted time! Hi Jane! I really hope you can give it a try soon. It’s perfect for this chilly fall weather. And thanks so much for letting me know about your site. I’ll definitely check it out! I made a batch last night and can’t wait to try it! It looked and smelt amazing. Have you ever tried freezing any leftovers? Happy to hear you gave it a go Kim! I haven’t frozen this specific chili, but I find chili freezes fairly well. You may just have to add a little extra liquid when you reheat it as it’s a thicker chili. I really hope you liked it! Other with a 28 oz can of puréed tomatoes. To add pumpkin, perfect addition!! So glad you enjoyed it Charleen! It does sounds like a weird combo, but really makes for a delicious, festive chili! Hi Grace! Did you make the chili? If you find it spicy, the only thing I can think to do is cut down on the amount of chili powder! I hope that helps!! Another winner in my house! I have to admit, I was a little worried as I was mixing in the can of pumpkin purée, but everything comes together so nicely. I did add some vegetable broth to mine to make it less thick. 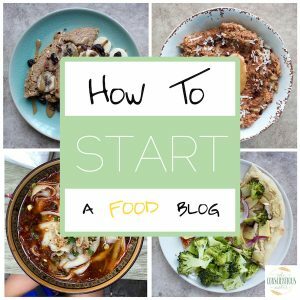 Another super easy, healthy, and delicious meal! Thank you Faith! Yay!! I know, adding pumpkin purée seems weird, but it works! So glad you all enjoyed it Dena!